Whether or not you may agree with health care reform (aka Obamacare) is irrelevant. The important thing to me about yesterday's ruling to let it stand is that it appears that at least a majority of the court has decided the Supreme Court is where law should be made. Congress makes law. Not 9 people. The other encouraging aspect to this is that a very conservative justice joined the left leaning side of the court thereby giving one reason to believe that maybe, just maybe, the Supreme Court is capable of being objective. All of this represents a small step but it's a start. Sweet crude hits new low-$75 a barrel. Price of gas nationwide at the pump down 75¢...EXCEPT in Connecticut! What's up with that? I know we have the highest gas tax in the country but even so, why isn't the price going down more? I've heard and read that it has to do with "zone" pricing. It's not what gas costs to produce and transport. It's all about what the market will bear...and apparently we folks here in CT can "bear" more. Masonicare of Newtown hosted a morning of activities for families. Activities included fishing in their large pond, a petting zoo, crafts and food. 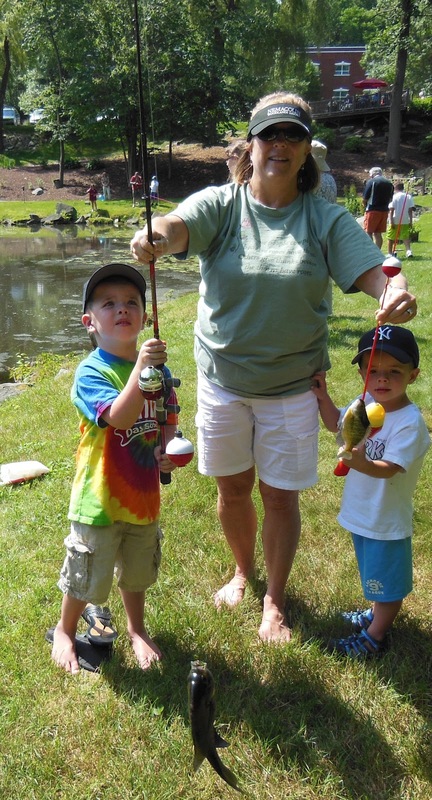 Pictured here is Sandi with Cole & Nicholas each displaying their first catch of the day. 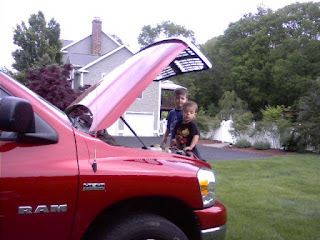 Nicholas and Cole have an odd obsession with the engine compartment of my truck. On the other hand, being little boys I guess it's not so odd. My grand daughters have never shown any interest in it at all. I'm convinced we're pre-wired for such things. Anyway, as is often the case shortly after we go out to play, they ask me to put the hood up and then they stand on the bumper to look things over. Inevitably the questions start. What does that do? Why? What are those for? Why do you need them? What would happen if they didn't work? Suppose I climb in there and you drive away. What would happen? Why? Why do you need a fan? Suppose something broke? Could I help you fix it? What's an air cleaner? Is it for us to be healthy? Where does the smoke go? Why isn't there smoke when you drive if you're burning something? Can you put juice it it to make it go? Why? And on and on it goes. And yes I patiently answer every question. Soon they have the information they need so the next stop is the back of the truck where they like to climb in and explore but mercifully the back of the truck doesn't prompt as many questions except they can't understand why they can't ride back there when we go somewhere. After all, his daddy and Aunt Becky did it when they were little so why can't they? Happy Father's Day to at least two great fathers out there--Peter Stockwell & Mike Sullivan. Modesty prohibits me from including myself but I guess I did OK.
Today is Flag Day. 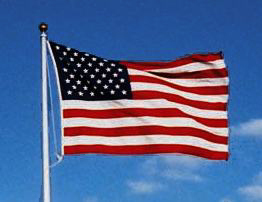 Try to find a moment to throw a salute to Old Glory. Have you had your Miranda rights explained to you? It was on this date in 1966 that the Supreme Court of the United States confirmed your right to remain silent and warned you that anything you say may be used against you. More people--especially certain politicians--need to exercise that right. If they did, imagine how much more peaceful the world would be! Today was yet another milestone in the Stockwell family. Cole graduated from preschool. This is not the first such event nor will it certainly be the last. But as they occur I'll post news of them here with pictures. For more pictures go to the photo gallery of my website and click on the link labeled Current Family Photos. Monday and Tuesday were normal with babysitting and volunteer stuff but Wednesday I had to be at Pete's early because he had a meeting. The day began with the boys at 7 A.M. and ended at about 5:15 P.M.
Thursday I spent the afternoon with Courtney searching for slugs in the garden. We found a lot of them and deposited them in a container she had for them. Then Courtney & I got Brooke off the bus. Brooke did her homework and we ate an early dinner after which I drove them to their T Ball game. Given the fact that I tend to dislike activities that are not organized properly, it was a little annoying. There were kids running all over, getting in the way of the on-deck batter and generally not quite as orderly as usual. At the end of the game one of the girls was running around doing cartwheels and managed to kick Brooke in the face. On that unhappy note we went home only to have Courtney become very upset with me for not letting her finish what I thought was a complete sentence. Poor Becky came home to a rather confused mess. Friday was calmer but equally busy. Blood work and yard work in morning, a dreadful round of golf in the afternoon but a pleasant evening with our friends. Today (Saturday) it's work on the pool, go to Cole's preschool graduation and the girls' recital tonight. Tomorrow it's off to Becky's in the afternoon for a while. Monday it all starts over again. It may be busy but it's all good stuff and it's better than sitting around wondering what to do. On June 5, 1975 Becky Stockwell, now Becky Stockwell Sullivan, came into the world. Hope she has a great day. We celebrated her birthday over the weekend. With Pete & Jen back from Florida the boys and Sadie have returned home. The house is way too quiet. Sandi and I thought for a while we had gone deaf. But the up side is today and Wednesday are Grampy days. For a week we went from being grand parents to the role of parenting and we discovered how hard it is. It's one thing to baby sit for a few hours or even a day but then you go home and relax. Parenting requires a 24/7 commitment. Not an easy thing to do--especially where both parents are working--or more difficult yet, how about working single parents? I know there's a Mothers and Fathers Day and even a grand parents day but I wonder if there's a Parents Day. It's June! One of my favorite months. Not quite summer-hot yet and lots of flowers in bloom. Here's a little information about June.